Op de spionagebeelden nog dik verpakt, maar de render van Avarvarii, één van de bekende Photoshop Tuners, geeft een aardige indruk hoe dit er uit zou kunnen zien. De spionage foto’s van dit artikel zijn verwijderd i.v.m. de rechten van de eigenaar die hier niet mee akkoord ging en we de keuze hadden tussen betalen of verwijderen. Uit voorzorg dat ons een mega boete boven het hoofd hangt, hebben we de foto’s van het betreffende media bureau preventief verwijderd. Ford has been caught testing a very early version of its all-new Fiesta-based small SUV. 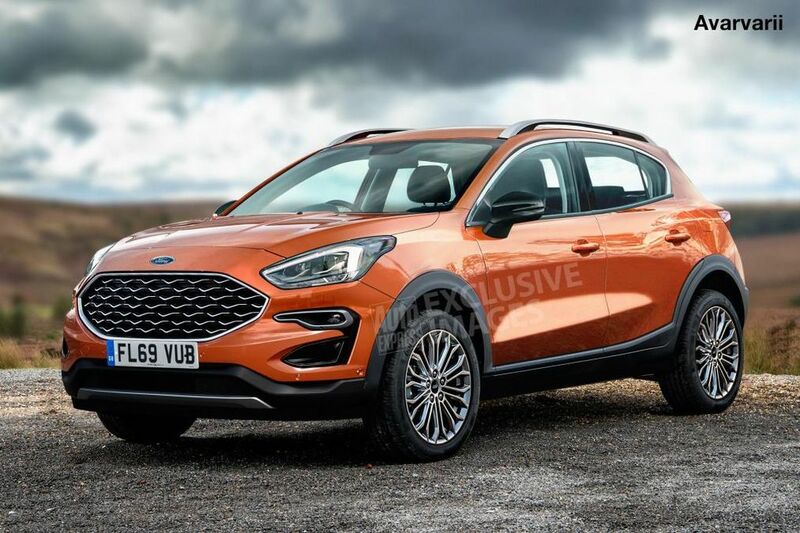 This heavily-disguised test mule will evolve into a replacement for the firm’s EcoSport crossover, and our exclusive image previews how the car could look when it arrives at some point next year. The as-yet-unamed SUV will join the Fiesta Active in the company’s compact crossover range and the manufacturer will hope the new model can rectify the shortcomings of the current EcoSport by offering extra interior and boot space, plus a more premium cabin. Our spy photographs also show Ford’s new compact SUV will at last ditch the EcoSport’s side-opening bootlid in favour of a conventional top-hinged hatch. We expect the new SUV to offer a taller ride height than the current Fiesta Active. It will take an evolutionary approach to design, with a recognisable nose and similar headlamps to the Fiesta, with built-in daytime running lights. Black cladding will give the car a rugged look, while bulging wheelarches and roof rails bring it in line with rivals. The new model is all but certain to feature Ford’s latest range of 1.0-litre three-cylinder EcoBoost turbo petrol engines, along with the familiar 1.5-litre four-cylinder diesel. There’s a chance the maker may even offer the car with the naturally aspirated 1.1-litre petrol for the base models in an effort to lower the starting price. A choice of either a six-speed manual or six-speed automatic gearboxes will also be available. The EcoSport’s three-tier trim range is likely to be carried over, separated into Zetec, Titanium and ST-Line specs. Zetec models would be the core of the range, while Titanium and ST-Line would offer greater focus on luxury and sporting styling respectively, for similar prices. There’s a good chance a plush Vignale version could be offered, too, given that the luxurious trim is said to have hit its internal targets on the current Fiesta. This early glimpse of the SUV means we’re unlikely to see it in dealers until the first half of 2020 at the earliest. When it arrives, expect it to carry a price premium over the Fiesta Active, which currently starts from £18,845. A standard Zetec could cost from just under £20,000, with the Vignale at around £23,500.